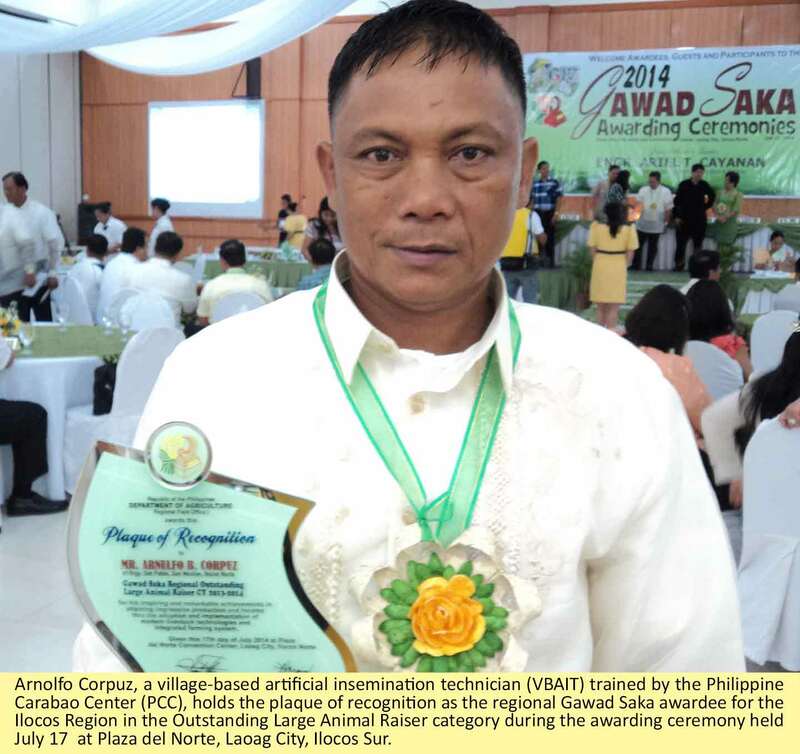 FRANCISCO ALEX DANI PASION, PCC’s “Outstanding Village-based Artificial Insemination Technician (VBAIT)” for 2012 is also this year’s “Outstanding Large Animal Raiser” in the national Gawad Saka awards of the Department of Agriculture. Twenty-four other farmers and institutions in the agriculture and fisheries sectors were carefully selected for this year’s “Outstanding Achievers in Agriculture and Fisheries”. The awarding ceremonies were held last November 13 in time for PhilRice’s launching of 2013 as the National Year of Rice (NYR) at its central experiment station in Maligaya, Nueva Ecija. DA Secretary Proceso J. Alcala led the awarding ceremonies. He also read a message from President Benigno Aquino III extending his words of felicitations to the DA family and to all the Gawad Saka awardees whom he regards as “role models and movers of society”. Pasion, 44, of Marcos, Ilocos Norte, said that he and his family are very happy with the new blessing. He said he already gains fulfillment with the positive feedbacks that he gets from his neighbors and supporters on how he does his job as a buffalo raiser but to win an award is giving his work more meaning. Passion was hailed by the search committee for his “passion” to upgrade his skills and knowledge on the best technologies in animal raising so that he can be a better servant in his community. He also showcased his commitment in buffalo raising by actively engaging in activities that will support the government’s program to boost the local dairy industry. Passion is raising six dairy buffaloes, three of which are currently in their lactating period. He also fulfills a social obligation by providing his neighbors a means of generating income by sending his eight buffaloes for “paiwi”. Aside from his active engagement in dairying, he is also serving some 600 farmer-raisers of both carabao and cattle as AI technician in the municipalities of Marcos, Dingras, Banna, and Sarrat. With these services, he posted an average calf drop efficiency of 40 percent. Pasion is a virtual champion VBAIT for effectively demonstrating a best practice on 100 percent monitoring of all the carabaos that he inseminated and for posting a steadily increasing number of AI services. He is currently the chairman of the Ilocano Artificial Inseminators Credit Cooperative (ILAICC) with over 35 members. Passion received his plaque and cash prize of Php150,000 with his wife Hortencia in the presence of some 500 guests in the occasion. He said he will use his cash prize, including the Php30,000 that he received as the regional winner, to purchase more dairy buffaloes and augment his land area for forage production. Another recipient of the Gawad Saka award, Arthur Tabbu, is also an advocate of the Carabao Development Program thru championing a carabao-based enterprise in the Cagayan region. Tabbu is this year’s “Outstanding Agri-Entrepreneur”. He is the general manager of the Lighthouse Cooperative, Inc. based in Tuguegarao City and the manufacturer of the popular label Carne Ybanag that offers a variety of processed carabao’s meat recipes such as longganisa, tocino, and tapa. The coop is also the maker of the equally popular “Chicharabao” or crackling made of carabao’s skin. With the numerous recognitions that both Pasion and Tabbu have received, they are living testimonies of how the carabao has become not only a mere source of income but empowerment among smallholders and their families.